Small bones found in the coffin below the mother’s pelvis. Italian archaeologists have uncovered a Medieval grave containing the remains of a woman and a fetus lying between her legs. 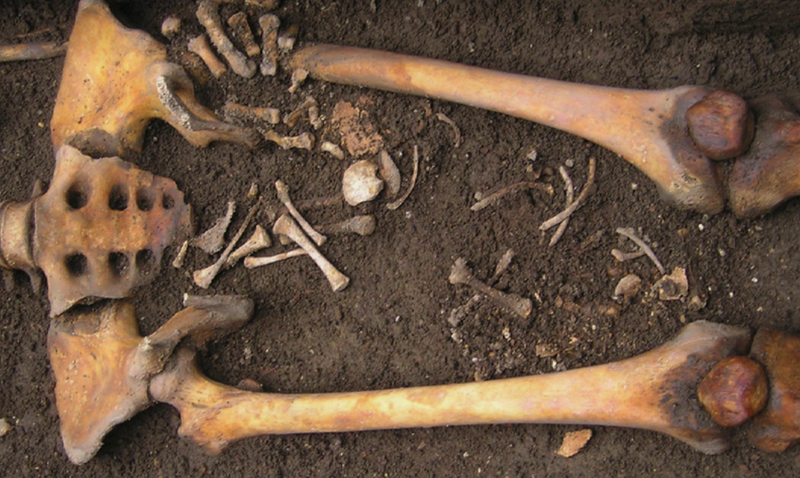 It’s a grim example of a “coffin birth,” say the researchers, but there’s even more to this horrific Middle Ages tragedy than that. Archaeology is often a lot like forensics. Investigators come across a scene and then have to piece together what happened from the available evidence. Take this latest research as a case in point. Back in 2010, archaeologists uncovered a strange Middle Age burial in Imola, Italy, dated to the 7th or 8th century AD. The stone-lined grave contained an adult female skeleton that was lying on its back, indicating a proper, intentional burial. But the archaeologists also discovered a pile of small bones below the pelvis. What’s more, the woman’s skull had a small hole in it, complicating the scene even further. This extraordinary discovery warranted further investigation by researchers from the Universities of Ferrara and Bologna, the results of which have now been published in the science journal World Neurosurgery. Based on the evidence, the researchers say the scene is an example of a “coffin birth,” or “post-mortem fetal extrusion.” This is a known, but rare, phenomenon that occurs during the decomposition phase. Around two to five days after the death of a pregnant individual, gas builds up inside the body, eventually forcing the fetus to be ejected from the vaginal canal, resulting in a post-mortem birth. Researchers say the fetus had already died when the mother was buried. It sounds like something from a horror movie, but other examples of this exist in the scientific literature (see here, here, and here). According to the new analysis, the woman was somewhere between 25 and 35 years old when she died, and the fetus was at 38 weeks of development (just two weeks shy of being full term). The baby’s legs were still inside the mother’s body, but its head and upper body had dropped below the pelvic cavity. The fetus was already in its head-down orientation (the cephalic position) and was positioned for birth. The hole in the woman’s skull measured 4.6 mm across, and it was located near a small incision on the forehead. The researchers say this is evidence of trepanation, an ancient form of brain surgery. The nature of the wound suggested surgical origin rather than a violent impact. The woman lived for about a week after the trepanation, as her skull exhibited the first signs of bone healing. The suggestion that Medieval doctors performed a primitive form of brain surgery on a woman who was 38 weeks pregnant may seem wholly bizarre, if not completely inappropriate, but the researchers have a very plausible explanation: The trepanation was done to treat the woman’s eclampsia—a hypertensive pregnancy disorder. This condition, characterized by high blood pressure and protein in the urine, is a more severe form of preeclampsia. Eclampsia affects women after the twentieth week of pregnancy, and it’s one of the (still to this day) most common pregnancy-related disease, and the leading cause of maternal deaths. Importantly, trepanation was used in the Middle Ages to treat symptoms very closely related to those triggered by eclampsia. In this case, frontal trepanation was used to relieve the woman’s intracranial pressure. Pasini said his team was surprised to find evidence of both trepanation and a coffin birth in the same grave, as only a few cases of this form of brain surgery have ever been documented in Early Medieval Italy, while coffin births are exceptionally rare in the archaeological record. That said, Pasini says the eclampsia explanation is only a hypothesis, and that there could be other reasons for this finding, such as some other health condition that prompted the trepanation. Also, the cause of death could not be determined; the woman may have died as a result of the brain surgery, the eclampsia, or complications that arose during childbirth. Regardless, the discovery of these two rare phenomena on a single individual furthers our understanding of how pregnancy-related disorders were treated during this period. Cutting a hole in a pregnant woman’s head may sound barbaric, but these Medieval Italians were simply doing their best to save this woman’s life.